from "The Debt-Deflation Theory of Great Depressions" (Econometrica, 1933). Note: the tweet was cropped a bit when I embedded it, but if you click on it you can see the entire quote. Let's clear the air. Bill Belichek was my economics major classmate @wesleyan_u ('75). He understands inflation. On twitter, Diana Farrell (Wes '87) points us to a fantastic interactive graphic from Williams math Professor Satyan Davadoss. The varied paths from all the different majors is an excellent corrective to the widespread misperception that one's major determines one's career. Switzerland abruptly ended its ceiling on the euro-franc exchange rate last week, resulting in a 20% appreciation of the franc. This highlights one fact of fixed exchange rates: no peg is forever. This fact lends some drama to foreign exchange markets. Normally pegs collapse in the other direction - a country which is trying to keep its currency over-valued spends down its reserves of foreign currency and faces speculative attacks from traders who believe it cannot sustain the policy, and the attacks make the policy even harder to sustain (e.g., Britain's 1992 ejection from the european exchange rate mechanism). Since Switzerland's intervention involved keeping its currency under-valued relative to its market price, it was selling Swiss francs for euros. In doing so, it accumulated reserves, so the possibility of running out which could have forced a crisis did not exist. Normally, I'm not a fan of fixed exchange rates, but Switzerland's motivation for implementing the ceiling was understandable, as it faced huge financial inflows seeking a "safe haven" during some of the worst parts of the euro crisis. On the graph, the exchange rate is the euro price of the franc, so an increase is a franc appreciation. One can see the rapid appreciation in 2010-11 before the intervention, as well as the spike at the very end when the Swiss National Bank lifted the ceiling. One of the problems of a fixed exchange rate is that it forces monetary policy to follow an external objective, rather than focusing on the state of the domestic economy. 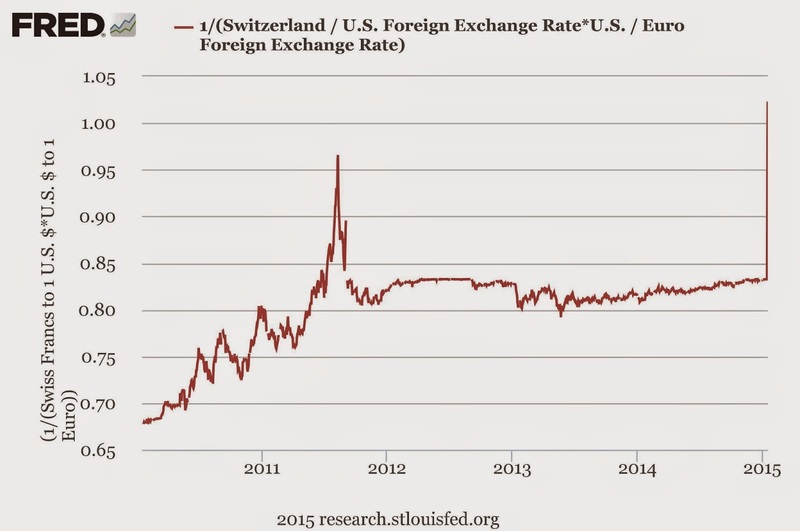 In this case, Switzerland's policy had been forcing it to expand the supply of francs. While this can be inflationary, in a world where deflation is the main worry, expansionary policy is appropriate (and Switzerland was not seeing any problems with inflation). However, Switzerland does have low unemployment and a huge current account surplus. Allowing its currency to appreciate will help its current account adjust. It also means that the franc will not be locked into following the euro on its downward trend relative to the dollar and other currencies (the SNB's move also makes it easier for the ECB to exploit the exchange rate channel to stimulate the european economy). Floating the franc does mean that the SNB once again faces the prospect of inflows seeking a safe haven - its trying to combat this with negative interest rates (the costs associated with holding large amounts of cash create a bit of space for negative returns on financial assets). There has been quite a bit of commentary on this, which Brad DeLong nicely rounded up in one of his "socratic dialogues." This guest post at The Economist's Free Exchange by Simon Cox of BNY Mellon seems to me like a sensible take. I definitely benefit quite a lot from editing. A nice touch on his part working in Lee Iaccoca, my childhood hero.